Looking for a gift idea for Christmas/Holiday? 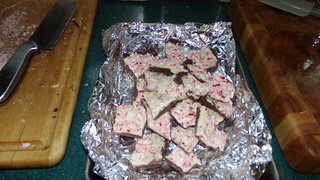 Have you ever tried making chocolate/peppermint bark? I have always loved this stuff when it comes out around the holidays. One year I had Paul running all over looking for some in a bag, Ghirardelli I think… and he finally found it, oh heavenly days Magee. So good. Recently, I stumbled on a recipe for this delectable delight and with only three ingredients, and hardly any cooking involved, how could I go wrong? Play the video and see for yourself. 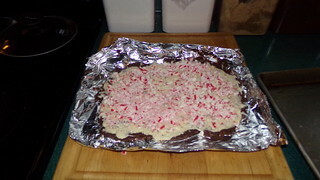 You get the two chocolates melted, the peppermint sticks pounded to a pulp in a storage bag, and pour in layers over tin foil on a cookie sheet. After you put the first layer of chocolate down, stick it in the freezer for a few minutes to harden. 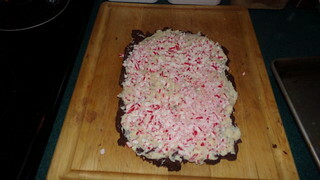 Then pour over the white chocolate layer (to which you have added about 1/4th of the peppermint candy) and then sprinkle the remaining peppermint candy bits over the top. Pat them down into the top layer and back into the freezer for a few more minutes, maybe 20-30. Once it’s firmed up, break it into chunks and put in a jar or tin. I kept mine in the jar in the fridge for a while but took it out and left it out thereafter, and it never melted – it was fine for a couple of weeks. Tip #1: If you wish to cut yours up into even sized squares, score the whole thing with a knife when you’ve finished doing the topping layer and before it goes into the freezer for the final firming up stage. I didn’t do that and I tried to cut it with a knife and it was too hard. Much better if it’s a bit warmer for that. But this candy is meant to be broken into uneven pieces of “bark” anyway. Tip #2: Use a peppermint stick candy that is not the real hard kind. 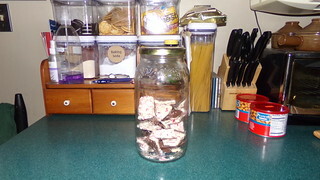 I buy “King Leo” peppermint candies in a blue and red tin. They are softer and easier on the teeth. You can find those here. Normally, I will change a recipe slightly when I’m trying something out like this. I wanted to add a tiny bit of peppermint extract to the white chocolate but I didn’t. It was perfect just the way this recipe is in the video. I used the white chocolate chips in a bag (a whole bag each of white (which isn’t real chocolate but vanilla chips) and a whole bag of milk chocolate chips. I think semi-sweet chocolate chips would work better actually… I heated each in the microwave and wasn’t that happy with how long it took to get them melted just right. I think I’d try the double boiler method on the stove next time. Melt in a bowl sitting atop a pan of boiling water, being careful not to let the bottom of the bowl touch the water underneath. So that’s my contribution for a homemade Holiday treat/gift. And the best thing about these is that just one piece will be plenty for a serving, at a time. They are quite rich, as you can imagine, but the coolness of the peppermint really adds to the great taste of these. My next project is to make some peanut butter cups. I will report back on those later. Believe it or not, we found the other day that they had crushed candy canes over at our local bulk food store. But I’m talking really crushed, like a powder. Might be a bit too small for this recipe. I am in agreement with TS with it sounding Christmassy at your home. I would go nuts since I do like chocolate. OH MY…I would have that all gone in a day or two…I have a very bad sweet tooth . I thought that, too, Maggie. That I’d never be able to just eat one piece, but you will be surprised… one piece goes a long way and is filling. You don’t want more than one at a time. I would have mine when Paul was having his nightly ice cream and cookie. And if I can do it – only one piece – then ANYone can… because I am a hopeless chocoholic too! If you make a batch or two, break them up and put into small tins for gifts, tape them shut… you will have them all ready when the need arises to give a small gift. Oh my those sound good!!!! I am a chocolate addict. If those were sitting on my counter top they would last barely a day! Sounding so Christmassy at Crow Cottage!